The Cordillera del Cóndor region is an eastern outlier of the main Andean chain that extends about 150 km from north to south, rises to a maximum elevation of about 2900 m, and forms part of the international border between Ecuador and Peru. The Cóndor forms part of the discontinuous chain of sub-Andean cordilleras that are situated between the Eastern Cordillera of the Andes and the Amazon lowlands, parallel to the main Andean chain but attaining more modest elevations and separated from the main Eastern Cordillera by lower elevation valleys. Besides the Cóndor, some of the other sub-Andean cordilleras include the Galeras and Cutucú ranges in Ecuador and the Cordillera Azul and Yanachaga ranges in Peru. Whereas the main Eastern Cordillera is comprised mostly of metamorphic and volcanic rocks, the sub-Andean cordilleras are made up principally of Mesozoic and early Tertiary sediments (sandstones and limestones) deposited at the western margin of South America prior to the rise of the Andes and uplifted concurrently with the main Andes, largely in the past several million years. Intrusive igneous formations, often bearing deposits of gold, copper, and other minerals, also form part of the Cóndor and the other sub-Andean cordilleras. The sub-Andean cordilleras, situated at the interface between the Andes and the Amazon, are certainly among the most biologically diverse and least known areas on Earth. These low mountain ranges, extending through more than 10 degrees of latitude, have not been conceptualized heretofore as a coherent biogeographical unit; rather, each separate sub-Andean cordillera has been associated, biogeographically, with the main Eastern Cordillera range at its latitude (e.g., the "ecoregions" of Dinerstein et al., 1995). However, on the basis of botanical surveys in several of the sub-Andean cordilleras that we and others have carried out in recent years, we suggest that these mountain ranges have in common geological and floristic features that set them apart both from the Amazon lowlands and from the main Andean chain, and we further suggest that the sub- Andean cordilleras merit consideration collectively as a distinct biogeographic region. This new understanding of the sub-Andean cordilleras has bearing on the interpretation of the evolutionary history of South America and also on conservation planning for the region. Recent botanical fieldwork in Ecuador and Peru has revealed a fascinating and unexpected biogeographical connection between the sub-Andean cordilleras and the Guayana Shield in northeastern South America. 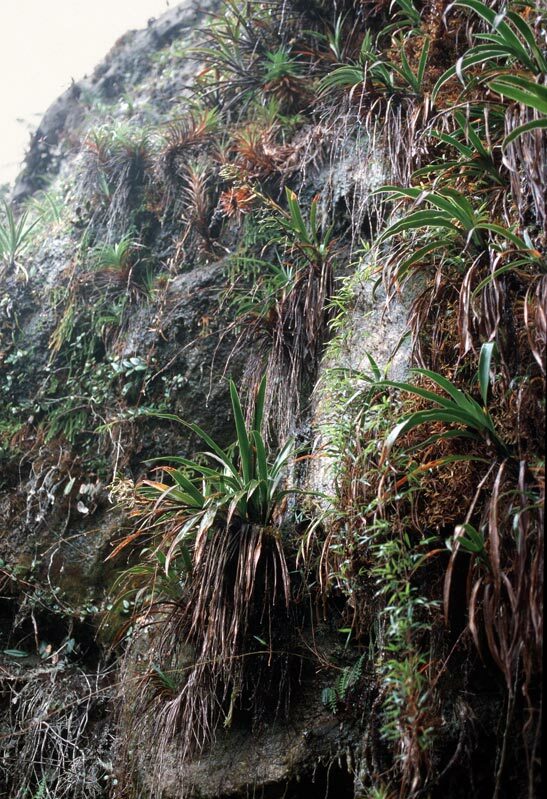 A number of plant genera once thought to be endemic to the sandstone mesas or "tepuis" of the Guayana region have been found to occur as disjuncts on the sandstone portions of the sub-Andean cordilleras, but not elsewhere in the Andean region (Berry et al., 1995). With each season of fieldwork, additional disjunct Guayana taxa are being discovered in the Cordillera del Cóndor and other sub-Andean cordilleras. These disjunct genera includeStenopadus (Asteraceae), Digomphia (Bignoniaceae), Everardia (Cyperaceae), Euceraea (Flacourtiaceae), Phainantha (Melastomataceae), Pterozonium (Pteridaceae), Perissocarpa (Ochnaceae), Retiniphyllum (Rubiaceae), Bonnetia (Theaceae), and Aratitiyopea (Xyridaceae). The Cordillera del Cóndor region may well have the "richest flora of any similar-sized area anywhere in the New World" (Schulenberg & Awbrey, 1997), and it almost certainly has one of the highest concentrations of vascular plant species yet unknown to science of any place on Earth. We estimate the flora of the Cóndor to exceed 4,000 species of vascular plants (about 1,900 species have been identified from collections made to date) and 300-400 species of bryophytes. Building on prior floristic fieldwork in the Cóndor region since 1990, we propose a comprehensive, three-year botanical inventory in the Cóndor region, using geological information and satellite imagery to guide further fieldwork. For over 160 years, the Ecuador-Peru border in the Cóndor region was in dispute, leading to armed conflict between the two countries in 1941, 1981, and 1995. Following the 1995 border conflict, the two countries began diplomatic negotiations, resulting in a peace treaty in 1998 that established the precise location of the international border. At present, a major bi-national conservation initiative is-under way in the Cóndor region involving close cooperation between the governments of Ecuador and Peru as well as with the native Shuar and Aguaruna peoples, whose ancestral territory comprises the entire region. The initiative is spearheaded by two non-governmental conservation organizations, Fundación Natura in Ecuador and Conservation International in Peru (Fundación Natura et al., 2000). Protected areas will be designated on both sides of the border, with the native communities actively involved in management of the reserves. The results of the proposed botanical inventory project will help guide regional conservation planning and implementation. Although the western slopes of the Cordillera del Cóndor in Ecuador have been partially deforested for establishment of cattle pastures, the core area of the region is largely intact. However, the prospect of environmental degradation and habitat loss resulting from large-scale mining is an imminent threat. The igneous formations of the Cóndor are rich in minerals, particularly gold and copper. Small-scale gold extraction by individual miners using traditional methods has been carried out in parts of the Cóndor for decades. Large mining concessions have been granted by the governments of both Ecuador and Peru, and proposals for large open-pit copper mines in the heart of the Cóndor range have been put forth. The specter of mining is the greatest challenge faced by the conservation initiatives in the region. The Cordillera del Cóndor region as we define it for this project comprises an area of about 1.1 million hectares (11,000 km²), including about 700,000 ha in southeastern Ecuador and 400,00 ha in adjacent northern Peru, from ca. 3°00.S to 4°30.S and 78°00.W to 79°00.W. In Ecuador, the study area includes all territory east of the Río Zamora and south of the Río Santiago in Morona-Santiago and Zamora-Chinchipe provinces, the entire watersheds of the Río Coangos in the northern portion, and the Río Nangaritza in the southern portion. In Peru, the study area includes the upper watersheds of the Río Cenepa and Río Comainas and the upper elevation areas adjacent to the Peru-Ecuador border; the area forms part of Condorcanqui province, Amazonas department. The lower portion of the Río Cenepa south of 4°00.S is not included in the present project. Comprehensive botanical inventories have already been carried out in the lower Cenepa region and adjacent areas of the middle Río Marañón and lower Río Santiago, southeast of the Cóndor region; Rodolfo Vásquez and colleagues at Missouri Botanical Garden are preparing a flora of the lower Cenepa region. The geological composition of the Cordillera del Cóndor region is an important key to understanding its unique floristic composition and its putative biogeographic links to the Guayana Shield region. The marine and epicontinental sedimentary formations in this sub-Andean region were deposited at the western margin of South America during the Mesozoic and early Tertiary, prior to the Andean uplift; the sediments were derived from erosion of the ancient Guayana and Brazilian shields (Campbell, 1971). The sedimentary strata exposed in the Cóndor region range in age from the lower Jurassic Santiago formation, with limestones and volcanic intercalations, to the Paleocene-lower Eocene Tena formation, formed of reddish clays. Of particular interest for this study are the mid-Cretaceous (Aptian-Albian) sandstone Hollin formation and the stratum above it, the limestone Napo formation. The western portion of the region is comprised of the massive granitic Zamora batholith. The strata were uplifted to their present elevations with the Andean orogeny of the Eastern Cordillera, since the late Miocene, with most of the uplift since the Pliocene, in the past 5 Ma (Gregory-Wodzicki, 2000). The Hollin sandstone is comprised of coarse- to medium-grained quartzite similar to the massive Guayana Shield sandstone formations, from which it is ultimately derived. The formation is about 150 m thick and is exposed in only about 6% of the Cóndor region in fragments ranging from less than 100 ha to over 20,000 ha in size. The sandstone fragments are dispersed throughout the region as an archipelago of different-sized islands in a matrix of non-sandstone substrates that form clay soils. The sandstone areas are typically flat-topped mesas with nearly vertical sides, and are easily detected in satellite imagery. As a result of the variation in uplift throughout the region, the sandstone mesas range in elevation from heights near the base of the Cordillera del Cóndor to their highest peaks at 2,900 m.
Environmental heterogeneity associated with differences in geological substrate and soil is a topic that has interested botanists for generations in many regions of the world (Kruckeberg, 2002). In lowland Amazonian Peru, floristic differences in areas of white sand vs. lateritic clays have been documented and patterns of beta-diversity associated with edaphic heterogeneity contribute substantially to the overall species richness of the region (Tuomisto et al., 1995; Vásquez & Phillips, 2000). Soils derived from sandstone are generally known to be highly acidic and very poor in nitrogen, phosphorous and other nutrients; sandstone and podzolized white-sand vegetation is typically stunted and sclerophyllous, and frequently a thick peat layer is formed atop the oligotrophic substrate (Anderson, 1981; Duienvorden & Lips, 1995). The dissolved humic acids in water draining sand and sandstone substrates impart the coloration of black-water streams and rivers. These characteristics of sandstone vegetation are observed in the Cordillera del Cóndor region as well. The botanical inventory work carried out in the Cóndor region to date has revealed readily observable differences in the structure and floristic composition of the vegetation on sandstone vs. adjacent non-sandstone substrates, but these differences have not yet been documented in a systematic way. At 1,000 m elevation, forest on sandstone is very dense with narrow-trunked, pole-size trees and a canopy 10 m tall or less, whereas forest on non-sandstone is much less dense with larger trees and a canopy height of 25 m or more. 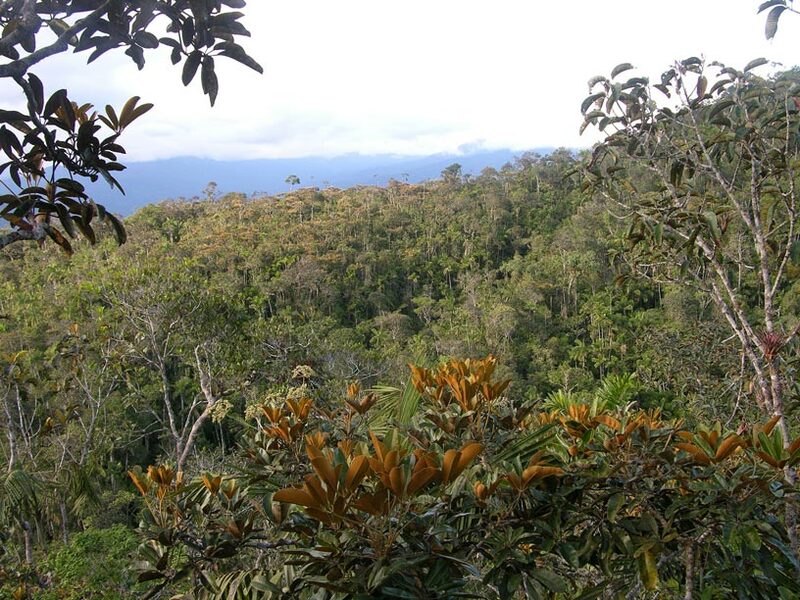 At 2,000 m elevation, the sandstone vegetation is a dwarf, very dense scrub with canopy of about 5 m, whereas on non-sandstone a more typical Andean cloud forest occurs with a 20 m tall canopy. Many of the species that occur on sandstone appear to be strongly restricted to that substrate type, including the Guyana disjuncts (see below), but some species evidently lack such substrate specificity, occurring on sandstone as well as on soils derived from limestone and igneous rocks. Among the principal objectives of this project is to document patterns of substrate specificity for the Cóndor region flora and interpret such patterns in terms of taxonomic relationships, life forms, and vegetation types. Some of the sandstone-restricted species in the Cordillera del Cóndor are also, it appears, very narrow endemics and may be found on only one or a few of the sandstone tepuis in this highly fragmented habitat. For instance, three species of Weinmannia (Cunoniaceae) with a dwarf, shrubby habit and very reduced, sclerophyllous leaves have been described from recent collections on different tepuis, all in similar scrub vegetation at about 2,000 m, but all three are known only from single populations despite searches for them in similar habitats on other tepuis in the region (Rogers 2002a, b). These observations remain merely anecdotal, however, until a more thorough and systematic floristic survey on different sandstone fragments can be conducted throughout the Cóndor region. Substrate specificity of saxicolous bryophytes has not been systematically documented in tropical montane regions, but initial observations in the Cóndor region suggest that the patterns of occurrence of mosses and hepatics growing on bare rock surfaces do show differences between sandstone, limestone, and igneous substrates, just as do vascular plants. In the Cóndor region, the Guayana disjuncts are found exclusively on sandstone substrate. The Guayana disjuncts form a minor component of the vegetation in the Cóndor region, where they occur in forests or scrub dominated by Andean taxa. The Guayana disjuncts in the Cóndor region (11 genera recorded to date) are only a small subset of the diverse endemic flora (135 endemic genera) of the Guayana shield (Berry et al. listed 138 endemic genera, but three are now known as sub-Andean disjuncts). Most of the disjunct genera are more diverse in the Guayana region, with up to 15 species occurring there and only one or two disjunct species in the Cóndor region and other sub-Andean sandstone cordilleras. 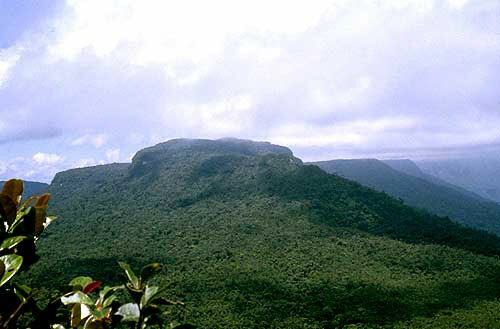 The available habitat of sandstone substrate in the Guayana highlands region is much older than that in the Cóndor and other sub-Andean cordilleras. The Roraima sandstones of the Guayana Shield are Precambrian marine deposits 1600 Ma old, ca. 3000 m thick, and uplifted to their present position beginning about 90 Ma in the mid-Cretaceous (Huber, 1995; Givnish et al. 2001). The Hollin sandstone in the Cordillera del Cóndor was deposited (from erosion of the original Guayana Shield sandstones) in the mid-Cretaceous (ca. 120 Ma), is only about 150 m thick, and was uplifted to its present elevation since the late Miocene but mostly in the past 10 Ma (Campbell, 1971; Gregory-Wodzicki 2000). Given this background, the most reasonable hypothesis for the disjunct distribution of the sandstone-restricted taxa between the Guayana region and the Cordillera del Cóndor and other sub-Andean cordilleras is that the plants migrated to the Cóndor region by occasional long-distance dispersal in relatively recent times, following evolution and diversification in situ in the Guayana region over much longer periods. On the other hand, there may be cases where plant taxa have migrated in the opposite direction, from the Andean region to the Guayana highlands, and then diversified in the latter region. Such a pattern was suggested by Struwe et al. (2002) for Symbolanthus (Gentianaceae), which is diverse in the Guayana region, less diverse in the tropical Andes, but for which several new, undescribed species have been found recently by the PI that grow abundantly in the Cóndor region (L. Struwe, pers. comm. 2002). The question of the Guayana disjuncts in the sandstone sub-Andean cordilleras of Ecuador and Peru is an intriguing facet of South American biogeography that warrants further attention. 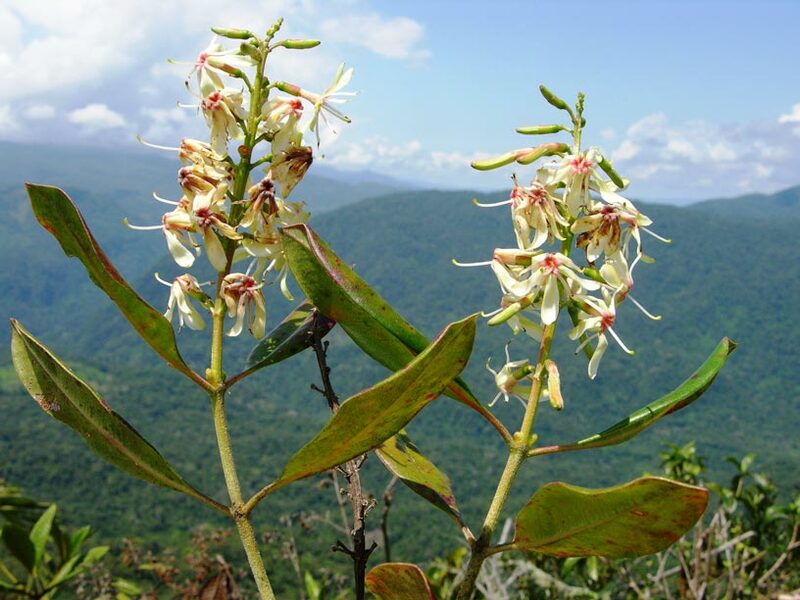 The proposed floristic survey project will help shed more light on this issue by revealing in more detail the distribution patterns of the Guayana disjuncts, and by providing plant material to researchers for molecular phylogenetic studies of the taxa in question. The PI, with Ecuadorian colleagues from QCNE, initiated botanical inventories in 1990 in the southern portion of the Cordillera del Cóndor region, the Nangaritza watershed. The initial collecting efforts in 1990-91 yielded more than 30 species new to science that have been published to date, as well as the first evidence of the occurrence of Guayana disjunct taxa such as Stenopadus and Phainantha on the sandstone mesas of the Cóndor region. 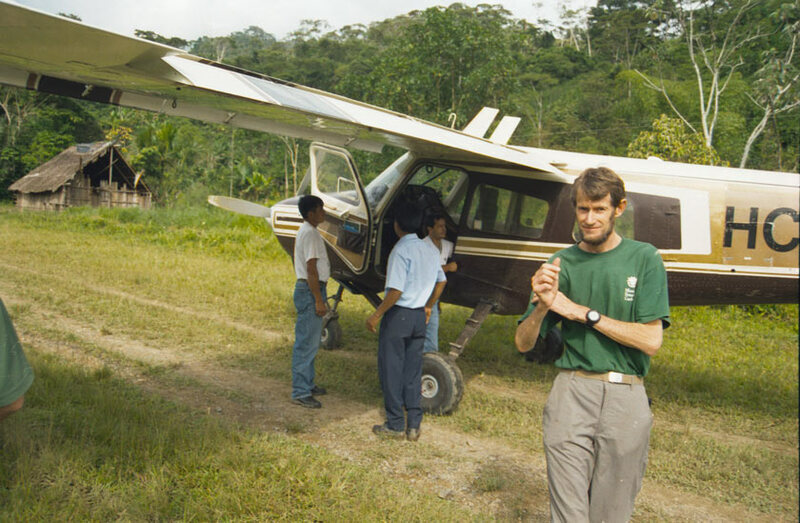 Two expeditions sponsored by Conservation International.s Rapid Inventory Program (RAP) surveyed animals as well as plants: in Ecuador in 1993, with Alwyn Gentry (MO) as lead botanist, in the Nangaritza and Coangos valleys and atop the central Cóndor crest; and in Peru in 1994, with Robin Foster (F) as lead botanist, in the upper Comaina watershed and atop the sandstone mesa of Machinaza (reported in Schulenberg & Awbrey, 1997). The first Co-PI of the proposed project carried out further botanical exploration in the upper Nangaritza basin in 1994, finding the disjunct Guayana fern genus Pterozonium. For the remainder of the 1990s, further explorations were not possible because of the border conflict between Ecuador and Peru in the Cóndor region. The tensions between the two countries over the border exploded into battle in early 1995. The fighting was concentrated in the upper Cenepa valley and lasted about 2 months before a ceasefire was agreed upon. During the battle, thousands of lethal land mines were placed by both the Ecuadorian and Peruvian armies in the upper Cenepa valley and along portions of the crest of the Cóndor. After several years of negotiations mediated by the U.S. and other Latin American countries, Ecuador and Peru signed a peace treaty in 1998 that established the precise location of the international border in the Cordillera del Cóndor. 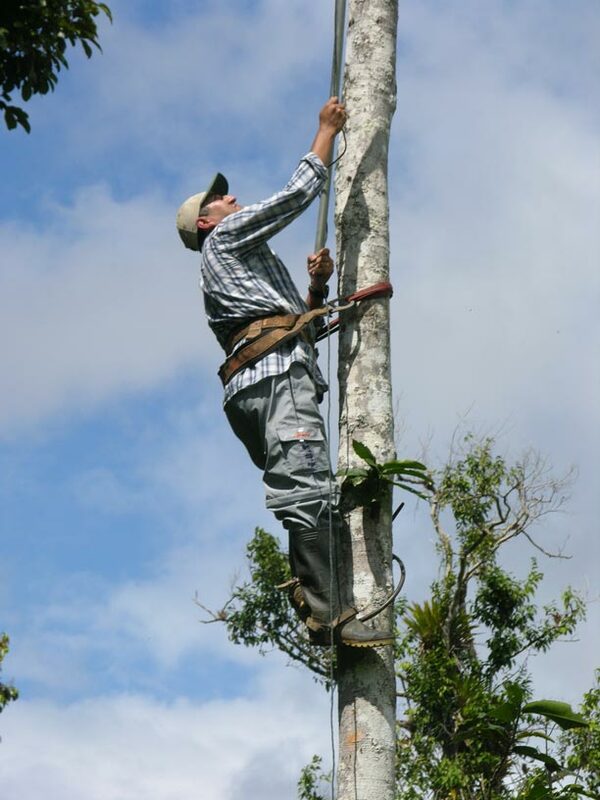 The PI, joined by Ecuadorian colleagues from QCNE, Ecuadorian post-graduate students, and native Shuar parabiologists, reinitiated botanical inventory work in the Cóndor region during 2000-2002 with support from the National Geographic Society. Botanical collections were made in a series of field trips in the northern (Coangos), central (Quimi-Tundayme), and southern (Nanguipa) portions of the Cóndor region in Ecuador. Concurrently, botanists from the University of Loja herbarium (LOJA) carried out botanical inventory work in the Nangaritza watershed. These collections resulted in discoveries of numerous species new to science, most of which are sandstone endemics and several of which have been published; e.g., Weinmannia auriformis Z.S. Rogers (Cunoniaceae) and Maxillaria jostii Dodson (Orchidaceae). The recent fieldwork has also added to the list of Guayana disjunct taxa on the sandstone mesas of the Cóndor region; e.g., Digomphia (Bignoniaceae), Everardia (Cyperaceae), and Retiniphyllum (Rubiaceae). The Checklist of the Flora of the Cordillera del Cóndor Region, Ecuador is available online at MBG's Web site. This is a dynamic checklist, which is linked to the TROPICOS database. Each time that a specimen is identified and the information is updated in the main TROPICOS database, the Cóndor checklist is also updated to include that species. 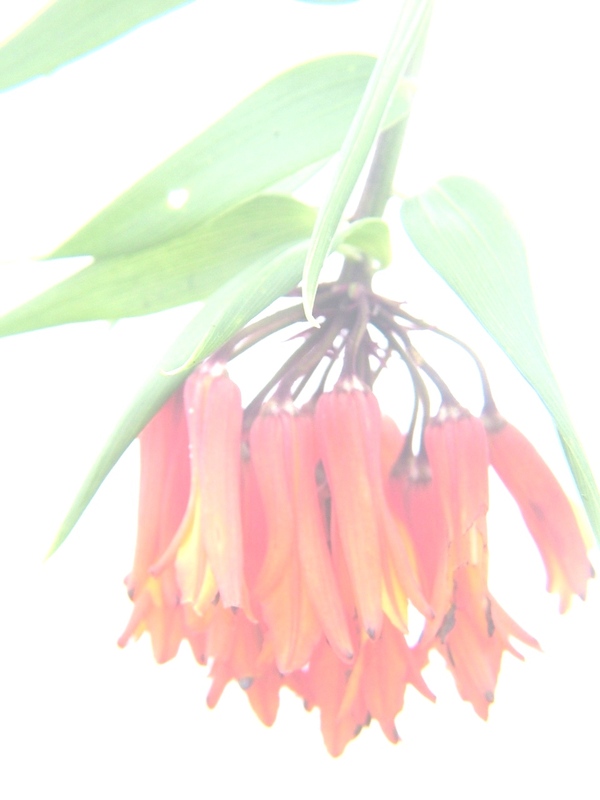 Images of plants taken in the field are also available on the TROPICOS database, indexed by the name of the species. Photographs of unidentified species are indexed by genus. The principal objective of this project was to carry out a comprehensive inventory of the vascular plants and bryophytes of the Cordillera del Cóndor region of southeastern Ecuador and adjacent northern Perú. Because we had previously, carried out some floristic inventory fieldwork in this region, intermittently from 1990 to 2003, and also had obtained the data sets of other botanical inventories made in the region by other botanists, we knew that the Cordillera del Cóndor had some areas of nutrient-poor, highly acidic sandstone geological formations, and that plants growing on these sandstone areas included species with phytogeographical affinities to the flora of the Guayana highlands of northeastern south America, as well as some locally endemic taxa. We also were aware from the outset that the flora on the sandstone plateaus of the Cordillera del Cóndor is markedly distinct, as a general pattern, from the floristic elements occurring on the adjacent nonsandstone formations (limestones, igneous and metamorphic rock types) in the same region. From the beginning of the project, we intended to concentrate on sampling the flora of the sandstone areas of the Cordillera del Cóndor, where the most distinctive and biogeographically interesting floristic elements were likely to occur. By studying the available cartography and satellite imagery of the Cordillera del Cóndor before initiating the fieldwork for this project, we realized that, due to variations in tectonic uplift and erosion of the Cretaceous Hollín Formation that forms the sandstone layer in the region, the sandstone plateaus occur in fragments ranging from a few hectares to more than 20,000 hectares in area, and at elevations from less than 300 m to over 2900 m. The sandstone plateaus are also situated at varying distances from one another, and due to orographic precipitation and “rain shadow” effects, also differ to some degree in annual weather patterns and moisture regimes. Therefore, we expected that the floristic inventory of the sandstone plateaus of the Cordillera del Cóndor could best be carried out as an exercise in “island biogeography”, considering the sandstone fragments of varying size, elevation, climate and distance from one another as “habitat islands” surrounded by a matrix of very different vegetation on non-sandstone geological formations. Our objective in planning the botanical inventory program, was to sample as many as possible areas of sandstone of different sizes, elevations and aspects. Another objective was to carry out quantitative studies of the forest vegetation in a series of one-hectare plots to determine levels of beta-diversity between forest stands on adjacent sandston vs. non-sandstone substrates. In actual practice, our botanical inventory activities were subject to some constraints in time, resources, and logistical considerations. We intended originally to carry out fieldwork on the eastern slopes of the Cordillera del Cóndor in the Río Cenepa watershed of Amazonas department, Peru. On the eastern slopes, we would expect rainfall to be higher than on the western slopes, and the flora would vary accordingly. Constraints in logistics, travel costs and difficulties in obtaining permission from local indigenous communities in the Río Cenepa region precluded us from conducting fieldwork in that region. In Peru, instead, fieldwork was carried out on the drier western slopes of the Cordillera, in Cajamarca province, and also on the western slopes for the total 150-km length of the Cordillera in Ecuador. We were not able to reach the highest sandstone plateau on the summit of Cerro Plateado at 2900 m elevation near the just inside Ecuador’s southeasternmost border with Peru. Nevertheless, we covered as much ground as possible during the three years of fieldwork, and amassed a considerable number of plant collections that begin to reveal the phytogeographic patterns of the flora of the Cordillera del Cóndor region. 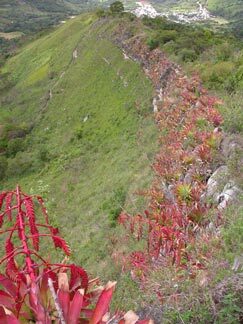 Prior to the initiation of this project in 2004, there were approximately 9,000 vascular plant collections recorded from the Cordillera del Cóndor region, 5,500 from Ecuador and 4,500 from Perú. About half of these prior collections were made by the PI and his Ecuadorian colleagues during 2000-2003, after the 1998 peace treaty between Ecuador and Peru resolved the border conflict between the two countries that impeded field work during most of the 1990s. The botanists associated with the project supported by NSF during 2004-2007 made approximately 13,000 collections of vascular plants in the Cordillera del Condor region, including about 11,000 from Ecuador and 2,000 from Peru, bringing the total number of vascular plant collections to about 22,000 for the region. The precise numbers of collections have not yet been determined since those made during the final 9 months of the project are still being entered into the TROPICOS botanical database administered by Missouri Botanical Garden. The first set of specimens has been given to the principal herbaria in the host countries: the National Herbarium of Ecuador (QCNE) in Quito and the Universidad Mayor San Marcos (USM) in Lima. Duplicate collections have been sent to Missouri Botanical Garden (MO); shipments are pending for collections made during the final 9 months of the project. In addition to the fertile collections, about 2,000 sterile vouchers were made from the marked and tagged trees ≥10 cm DBH in the six one-hectare tree plots. These sterile vouchers are housed at the QCNE herbarium in Quito, and with a few exceptions, will not be distributed to other herbaria. When the sterile vouchers are determined to species, and if no fertile collections were obtained from the same one-hectare plot, just one voucher per species per plot is entered in the TROPICOS botanical database, so as to provide a vouchered site record for that species for purposes of distribution records and biogeographical analyses. Cerro Kaputna is the north-westernmost outlier of the Cordillera del Cóndor, located on the south bank of the Río Santiago at the point where this large river makes an abrupt turn to the south and enters Peru; the Santiago continues south to its union with the Río Marañón. Cerro Kaputna is composed of both limestone as well as sandstone Cretaceous sedimentary rocks. Most of the sandstone outcrops that we have encountered in the Cordilera del Cóndor are above 1000 m elevation, but this area contains the lowest-elevation sandstone outcrops in the region, below 500 m. At these low-elevation sandstone outcrops, floristic elements occur that are typical of white-sand areas of lowland Amazonia but are not found on the higher elevation sandstone fragments; examples the understory herb Rapatea muaju (Rapateaceae) and the understory tree Dolichodelphys chlorocrater (Rubiaceae). This is the northernmost portion of the Cordillera del Cóndor region. A north-south trending tectonic graben separates the Cordillera del Cóndor proper from the parallel ridge to the east, the Cordillera de Huaracayo, and in the rift valley between the two cordilleras, the Río Coangos flows north, in Ecuadorian territory, into the Río Santiago, and the Río Cenepa flows south, in Peruvian territory, into the Río Marañón. The entire Coangos watershed is inhabited by Shuar communities, and we carried out floristic inventories during 2005 in several of these. The dendrology course in September 2005 was held in two Shuar communities, Kuankus and Yunkumas, and the first two one-hectare forest inventory plots were established: one on non-sandstone substrate at 670 m elevation, and a second plot on the sandstone plateau of Cerro Chuank Naint at 1150 m.
The Río Quimi is a “black-water” river that drains the largest area of sandstone in the Cordillera del Cóndor, and is a tributary of the Río Zamora in the central portion of the Cóndor region. The sandstone plateau at the crest of the cordillera in this region covers more thatn 20,000 hectares, at elevations of about 1800-2000 m, and forms the international border between Ecuador and Peru. 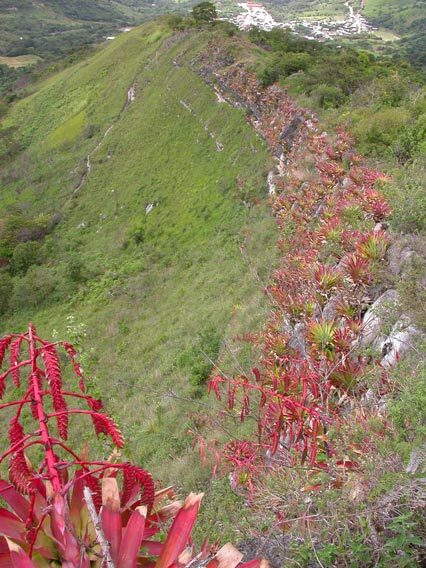 In 2006 the entire sandstone plateau was designated as two protected areas by the Ministry of Environment of Ecuador. The western slopes of the Cordillera below the sandstone plateau, however, do not have formal protection. The granite batholith below the sandstone contains a very substantial deposit of copper, and the Canadian-based mining company, Corriente Resources, Inc., owns the mining concession and has applied for a permit to open a large open-pit copper mine that will extract the mineral over a period of 20 years. During our field work in this region, we stayed as guests at the copper company field camp, and a large proportion of the botanical inventories were carried out in this area. The fourth and final dendrology course, and the sixth and final one-hectare forest plot inventoy, were carried out in this area in April 2007. This area is actually not within the Cordillera del Cóndor, but rather is part of the eastern slopes of the Eastern Cordillera of the Andes, in Zamora-Chinchipe province, west of the Río Zamora that nominally forms the western boundary of the project study area. We included botanical inventories in this area in part because we realized to our surprise that there are sandstone fragments in this area, outside of the Cóndor and attached to the main Andean range. The clue to this was the “black-water” river, the Río Kiim, that drains this area and is a tributary of the Río Yacuambi. 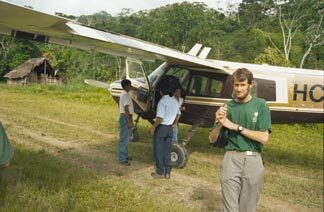 The area includes a 30,000-hectare forest reserve that belongs to three Shuar communities. The Shuar parabiologists carried out botanical inventories in this region during 3 one-month periods, and documented a number of species that are restricted to sandstone substrates and serve as “sandstone indicators” such as Centronia laurifolia (Melastomataceae). The upper watershed of the Río Nangaritza, in Zamora-Chinchipe province, drains a large area that includes sandstone plateaus as well as some limestone outcrops, and this area was a major focus of our botanical inventory activities. Much of the area is formally designated as the “Upper Nangaritza Protection Forest”, excluding the settled areas where farms and pastures in along the main river have been settled by three ethnic groups – the indigenous Shuar, and the native Saraguro and non-indigenous mesizo communities who migrated to the region from the Andean region of Ecuaodr. Two of the four dendrology courses were held at the community of Las Orquídeas, at the end of the gravel road that in the upper Nangaritza valley. 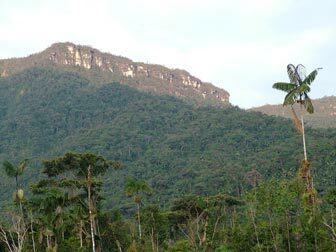 Three of the six one-hectare forest inventory plots were established in this area, on the sloping sandstone plateau southwest of Las Orquideas, in a formally protected area the “Las Orquídeas Tepui Reserve” that is administered by the community. Within Ecuador, this is the southernmost portion of the Cordillera del Cóndor and is part of the watershed of the Río Chinchipe, a major tributary of the Río Marañón. At the boundary between the upper Río Nangaritza watershed and the Río Vergel watershed is the highest summit in the Cordillera del Cóndor, Cerro Plateado at 2900 m, which is capped by a sandstone plateau. We believe that this summit is the only area where herbaceous páramo vegetation occurs on sandstone in Ecuador; however, due to the remoteness and difficult access of Cerro Plateado, we were not able to include this site in the floristic inventory work during this project. Three field trips were made to lower areas in the Río Vergel watershed. This region remains rather poorly sampled, however, and merits further floristic inventory work in the future. South of the Ecuador-Peru border, the main ridge of the Cordillera del Cóndor continues in a south-trending direction, and forms the boundary between the Peruvian departments of Cajamarca and Amazonas, until the range ends at the Río Marañón, southeast of the city of Jaén, Peru. The northern portion of the main Cóndor ridge in Peru is within the watershed of the Río Chirinos, a tributary of the Río Chinchipe. This area was the focus of floristic inventories carried out by the Peruvian forester-botanist, Juan Perea, during 2006-2007. In Peru, the ridge that forms the boundary between Cajamarca and Amazonas departments, east of the Rìo Chinchipe, is known as the “Cordillera Huarango”, although structurally it is the southernmost extension of the Cordillera del Cóndor. This area was the focus of floristic inventories by the Peruvian botanist, Eric Rodríguez of the Universidad Nacional de Trujillo, during two expeditions in July 2005 and April 2006. Inventories and collections of the bryophytes in the Cordillera del Cóndor region were made by MBG curator Steven Churchill, assisted by Edison Jaramillo, an undergraduate student from the Universidad Central del Ecuador, during November-December 2005. They carried out collections in the upper Río Nangaritza area and the the Rió Quimi area, in the central and southern portions of the Cóndor region in Ecuador. These inventories are complemented by earlier collections made by bryologists from the the National Herbarium of Ecuador during 2002-2003 in the northern portions of the Cóndor. Steven Churchill identified the bryophyte collections and compiled a list of the mosses recorded from the Cordillera del Cóndor. A full set of the bryophyte collections was given to the National Herbarium of Ecuador in Quito.